Hello, my name is Waj. And I’m officially a Pumpkin convert *gasp*. Before we move on, I have a confession to make. 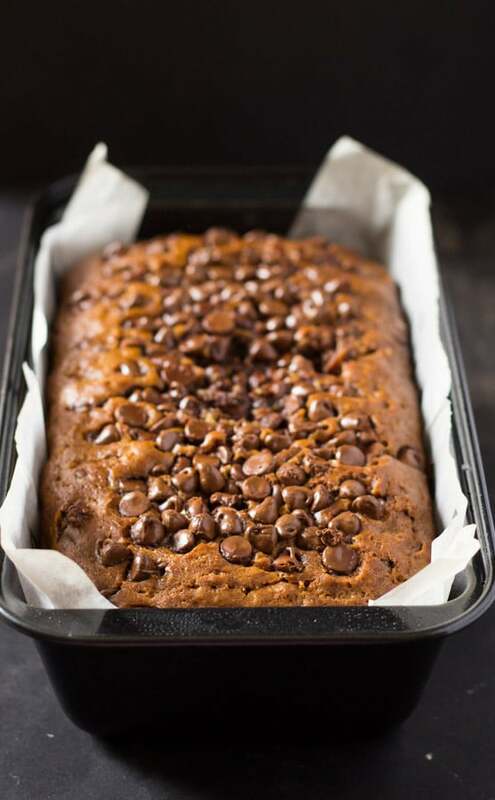 The thought of adding pumpkin to dessert always felt a little weird to me *double gasp*. I mean, an obsession with apple desserts, I can understand, especially in the fall season. But seriously, why pumpkin? What’s up with all the Pumpkin Spice Lattes and Pumpkin Cheesecake Bars taking all over my feed? 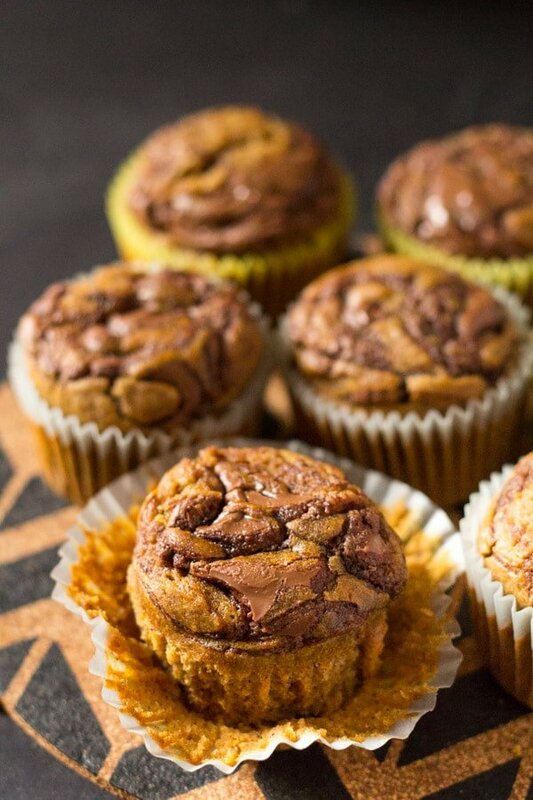 Every September my entire Pinterest feed is orange, thanks to all the pumpkin obsessed recipes floating around. And I finally gave in yesterday to the pumpkin craze just because I was so curious to see what all the fuss was about, and also this month’s Yum of the Month Challenge was to make anything pumpkin spiced! 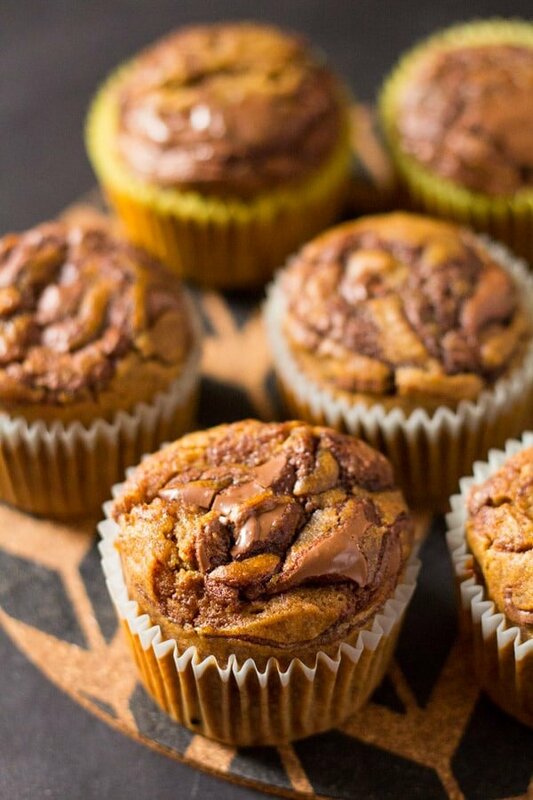 So for my very first pumpkin recipe, I made these Super Moist Pumpkin Nutella Swirl Muffins, and let me just say this, the entire house smelled BEAUTIFUL. Like if the feelings warm, cozy and comforting could be given their own scents and then bottled up into a perfume, that’s what my entire home smelled of. Happiness. I could almost hear a cozy fire crackling in the fireplace and hear the soft pitter patter of rain drops on the windows. Even though it’s still summer here in the Middle East and fall is practically non-existent. Sigh. But no worries. I’ve found the perfect solution to bring fall to home. And that’s by making pumpkin recipes throughout fall. If fall can’t come to me, I’ll bring it to my home with all things pumpkin spice. So get prepared for lots of pumpkin recipes coming your way, because I’ve just discovered the magic that all things pumpkin are. 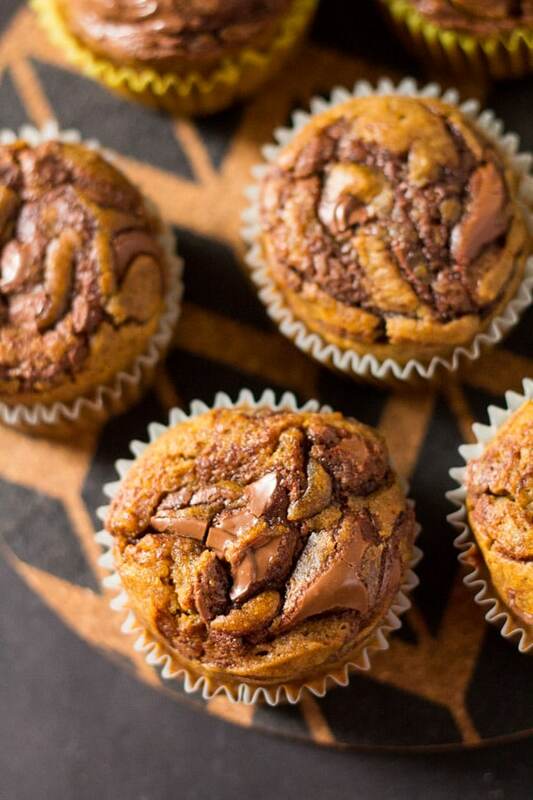 Now let’s come to these Super Moist Pumpkin Nutella Swirl Muffins. These ARE life changing, I swear. Okay, fine I exaggerate. They aren’t exactly life changing. 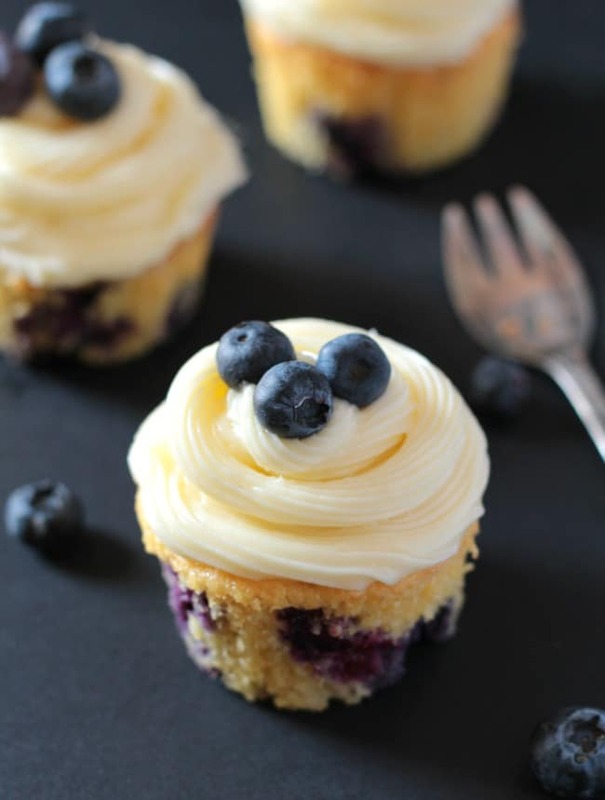 But if you’re feeling sad and cold one day, just make these muffins and you’ll feel all warm and content while baking these muffins, and then a ray of happiness while shine through your heart when you bite into one of these warm muffins and you might see a unicorn or two. Umm, okay, maybe I’ve had too many of these muffins and that’s why I’m talking weird now. It’s the pumpkin talking. Nevermind me, just read the following list of reasons of why you should make these muffins like NOW. 1.) They smell and taste like fall aka heaven. 3.) No electric mixer is required to whip these babies up. 5.) 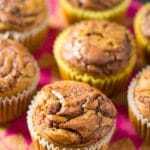 These muffins have a gorgeous scent and perfume the entire house while baking. The next hottest perfume? Preheat oven to 425 F (218 C) and prepare a 12 count muffin pan. Grease well with cooking spray or line with muffin liners. 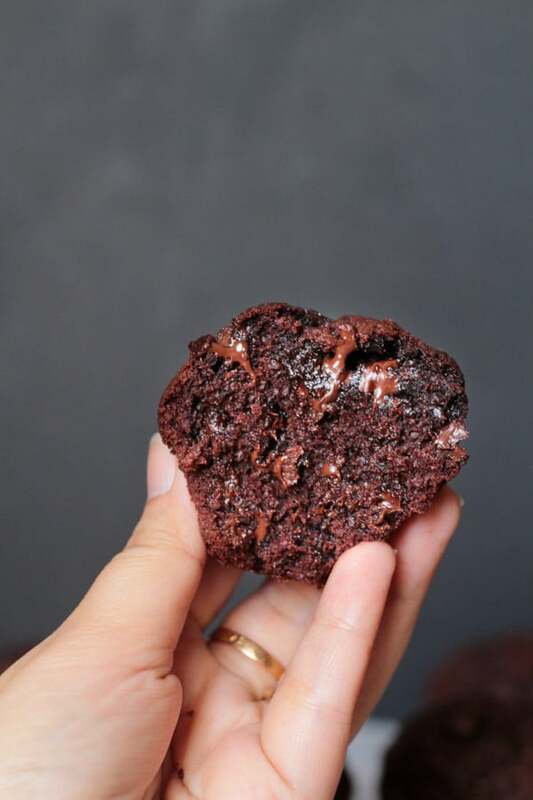 Since this recipe yields about 15 muffins, you can either prepare a second muffin pan, or bake the muffins in 2 batches if you have only one muffin pan. In a large bowl, combine the dry ingredients: all purpose flour, baking soda, ground cinnamon, pumpkin pie spice, and salt. Whisk lightly and set aside. In a separate medium sized bowl, combine the wet ingredients: oil, granulated sugar, brown sugar, pumpkin puree, eggs and milk. Whisk until combined. Pour the wet ingredients into the dry ingredients and whisk until you can no longer see the flour and all the ingredients are combined. Using a spoon or an ice cream scoop, fill each liner with batter until almost full. 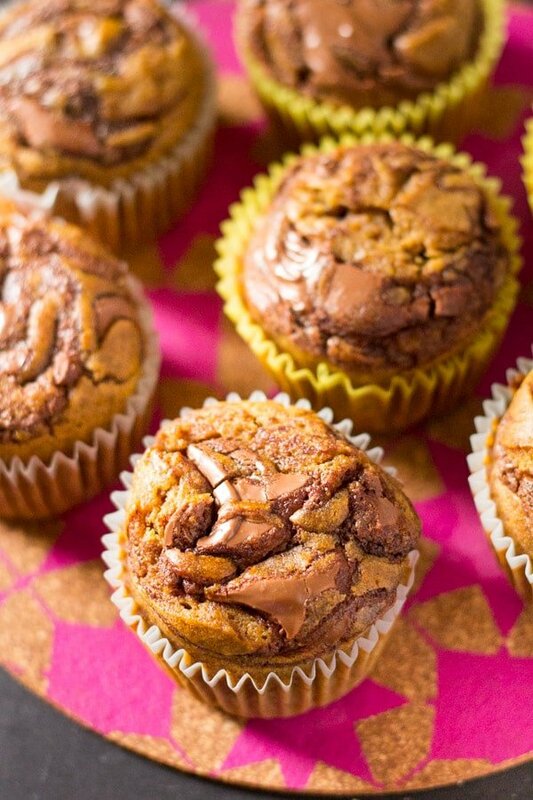 Drop little spoonfuls of Nutella in the centre of each muffin (about 1 teaspoon each). Using a toothpick, gently swirl Nutella in any pattern you like. Just make sure not to swirl too much, so that the Nutella swirl remains prominent. Bake in the oven for 5 minutes, and then lower the temperature to 350 F (177 C) WITHOUT removing the muffin pan out of the oven. Bake for an additional 15 minutes or until a toothpick inserted in the centre comes out clean. Let the muffins cool completely before taking them out of the muffin pan. 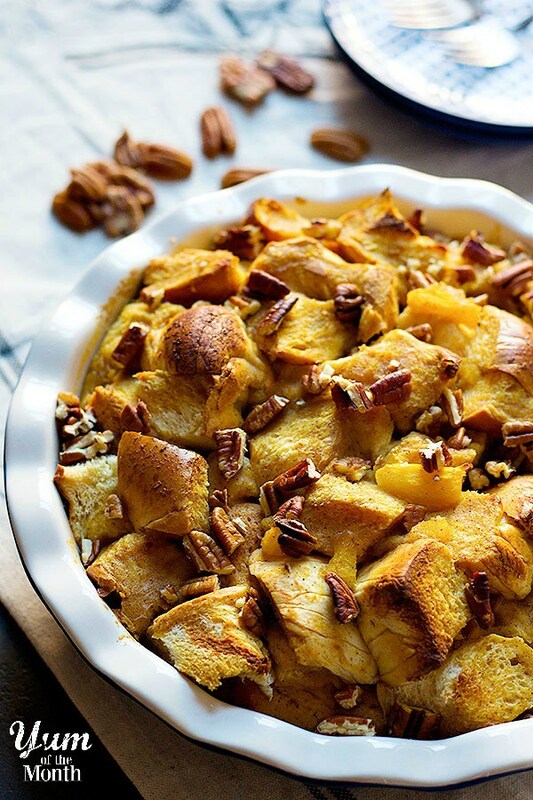 This Pumpkin Pecan Bread Pudding looks mouthwatering by Unicorns in the Kitchen. 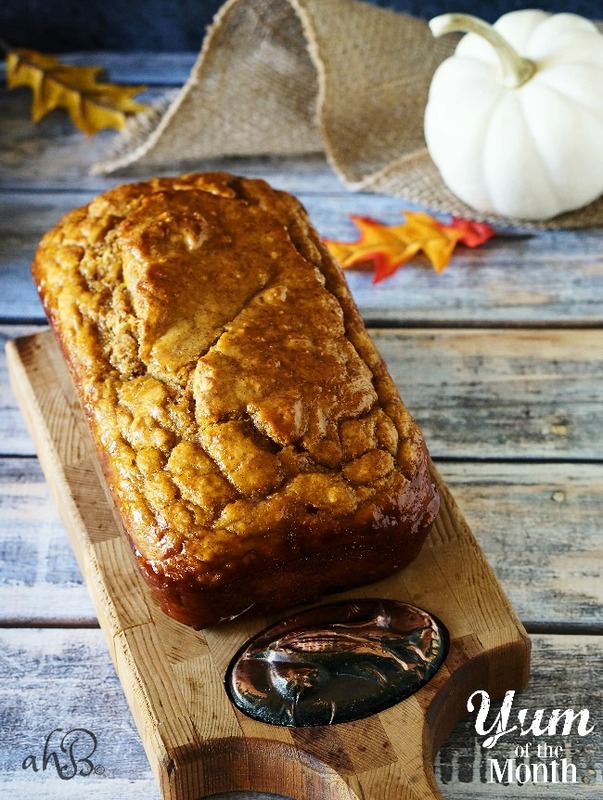 This fabulous Pumpkin Beer Bread is waiting to be baked by you! Brought to you by an Accidental Happy Baker. 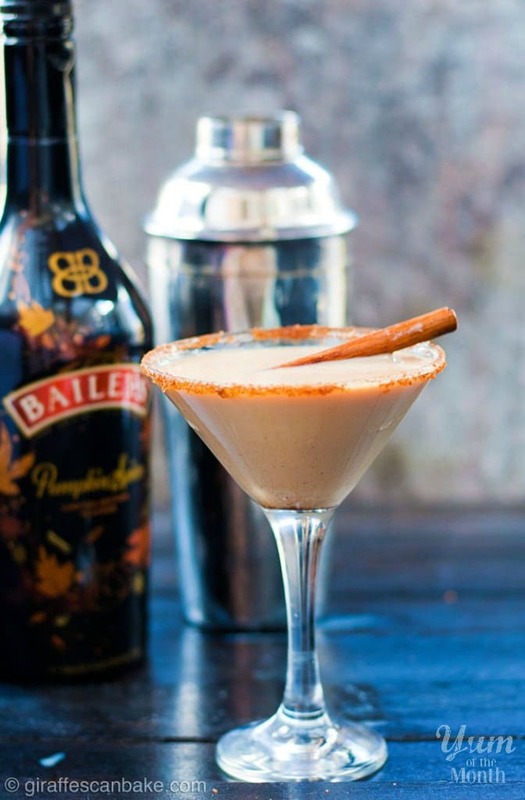 And here’s Bailey’s Pumpkin Spice Latte Martini by Giraffes Can Bake! 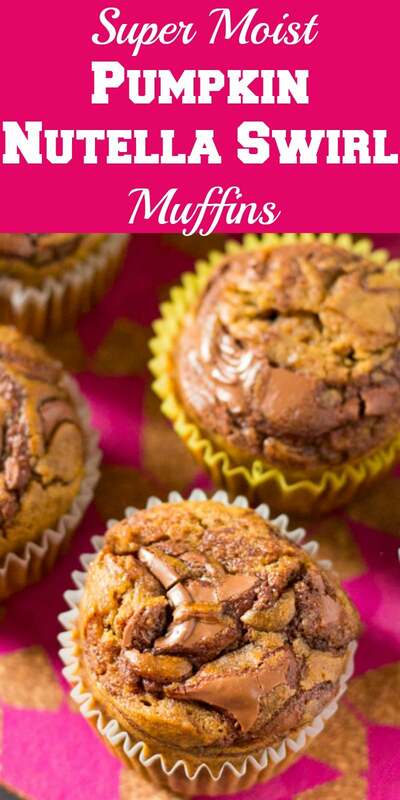 Hi Wajeeha, I loved the pumpkin Nutella swirlmuffin recipe . recently bought one n still lying unused in the fridge coz I had no clue what to cook with it .making a desert with kudoo ( pumpkin’s Urdu in subcontinent ) was totally alien to my Asian pallet. But these muffin were heavenly ! I’m so glad you’re a pumpkin dessert convert!! I absolutely love putting pumpkin in dessert, so I think everyone should know that joy! 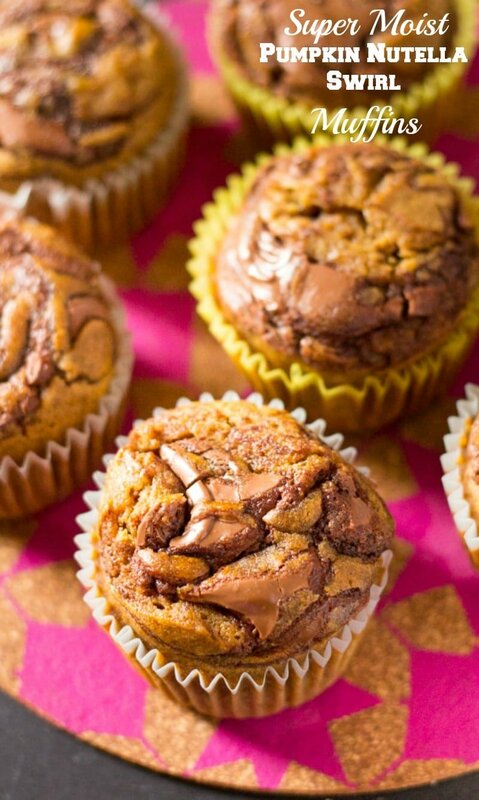 And no wonder these muffins would convert you, they could convert even the most avid pumpkin hater! 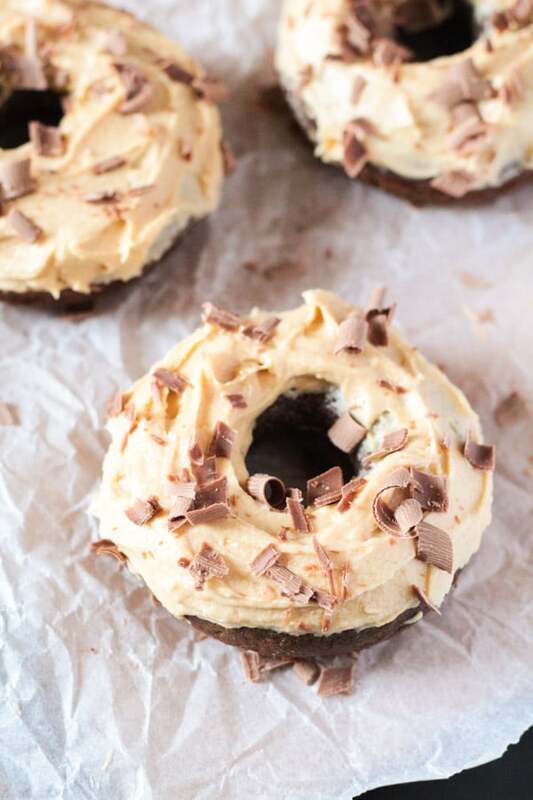 They look incredible, and that added nutella swirl is just perfection on top! My kids would love to find these in their lunchboxes! These are so pretty.